Spring has sprung and it's time to declutter! This is a public event to allow the Baltimore community to trade items with each other for free! (Think free yard sale.) The swap will be hosted by UBC from 9 am to noon on Saturday, May 18. If you cannot make it to the swap, but have things to donate, we will accept donations the evening before on Friday, May 17 from 6 - 7:30 pm. The swap meet will accept clothing, shoes, linens, and children's toys. The toys must be in working condition, less than 30lbs, and smaller than a plastic storage bin; (no swing sets or bikes). All items should be in good condition with no stains or tears. Please, no buying, selling, or any form of currency exchanges. Everything in this event is intended to be freely given and received. We hope that you will join us! 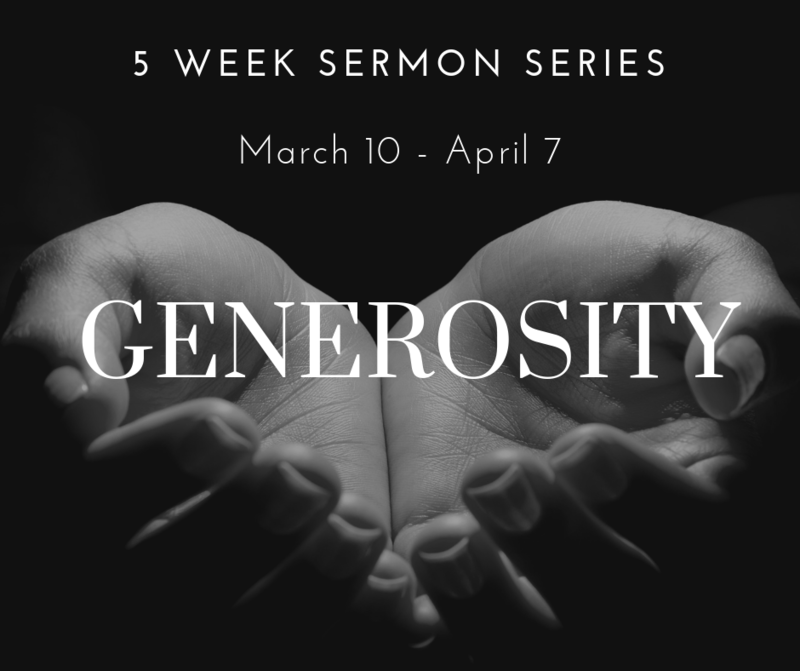 This spring we will address the theme of generosity in the Bible. We will reflect upon God’s generosity to us, which calls us to be generous in kind. When we are given great blessings, it is a wonderful gift to be able to share them. On a communal level, we will discuss what is required of our church as we work to build God’s kingdom here on earth. Looking for a great way to celebrate Mardi Gras? 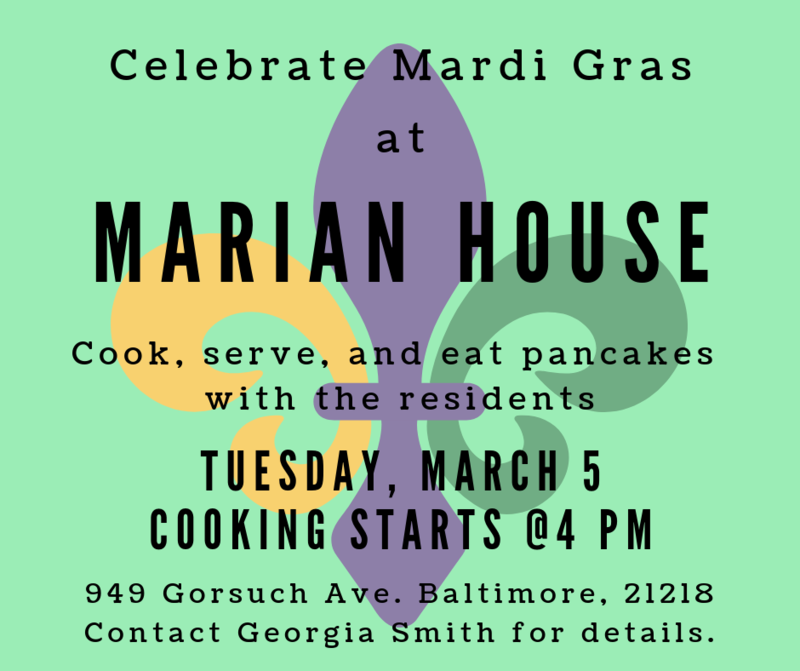 Join us March 5th at Marian House as we cook, serve and eat a pancake dinner with the residents there. Marian House serves women who are transitioning into stable lifestyles by providing them with housing and supportive services. During our MLK, Jr. Day of Service, members from UBC went to serve a meal at the house. They had such a good time and were so impressed by what they saw that we are looking for other ways to be involved with this organization. This should be a great event! Attention those who are in college and beyond: this event is for you! 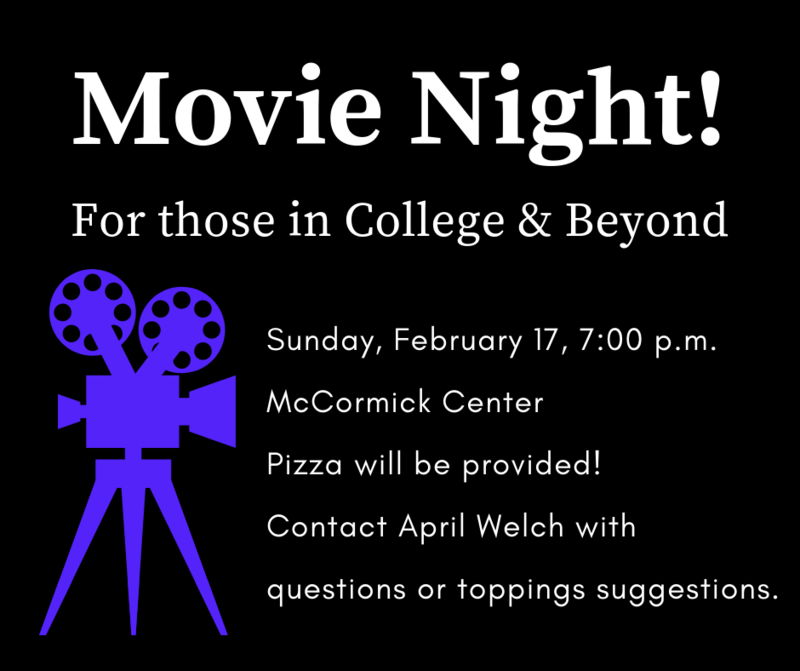 Please join us in the McCormick Center (downstairs) for a movie night at 7:00 p.m. There will be some delicious pizza to eat, and we will also enjoy a great time of fellowship. If you have any dietary restrictions or feel strongly about pizza toppings, please contact April Welch. See you Sunday, February 17th! 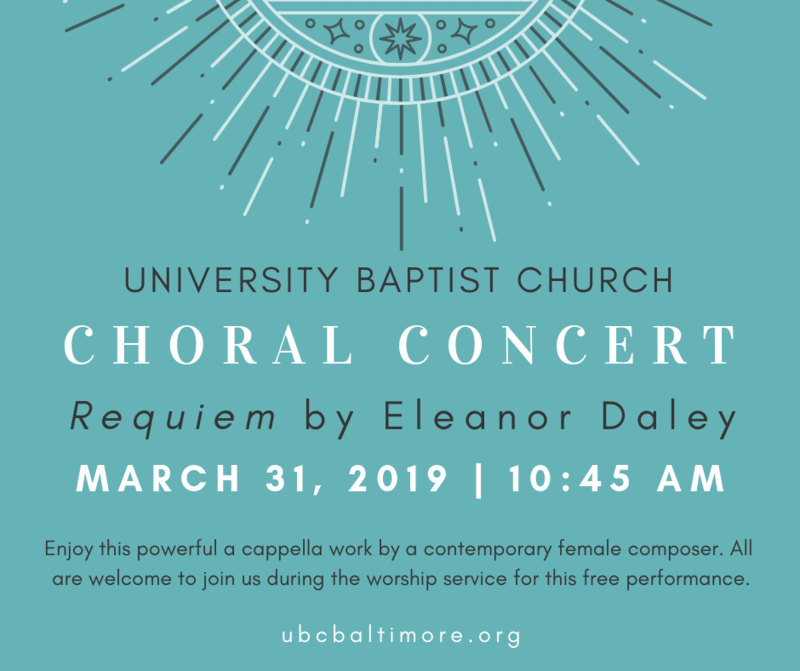 On Monday, January 21st, the Church of Charles — The Episcopal Cathedral of the Incarnation, First English Lutheran, Saints Philip and James, Second Presbyterian, and University Baptist — are coming together to serve Baltimore! The Churches of Charles have scheduled 11 separate activities as a way to serve our community this MLK Day. We will be returning to some of our favorites places like Woodberry Crossing and Baltimore Station and doing some of our favorite things like knitting, cooking, carpentry and card making. For more information and to sign up for a time slot, please visit the Day of Service website. Please sign up for the one(s) you wish to attend so that we know how many to expect and have enough supplies, etc.